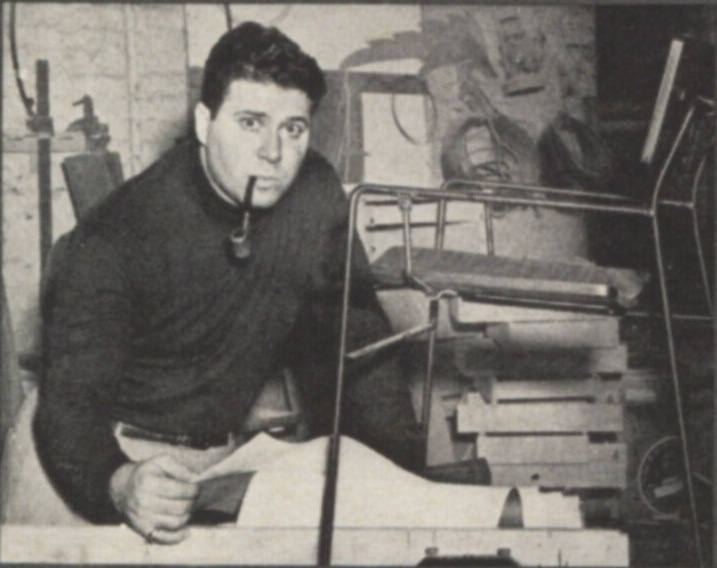 Information about Arthur Umanoff's designs and career. Arthur Umanoff's 1964 Grenada Collection for Boyuer Scott is quite possibly the most frequently mis-attributed of all of the Boyuer Scott and Shaver Howard collections. It's vague similarities to Salterini's 1951 Tempestini designed "Scherzo" or "Ribbon" collection coupled with a sum-total lack of available documentation on the Boyuer Scott production has provided ample fodder for error and misattribution even amongst some of the most reputable and scholarly dealers. 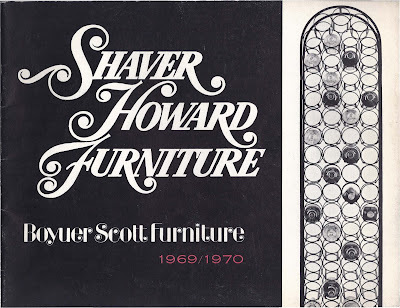 In late 1968/early1969 Shaver Howard purchased Boyuer Scott and made them a wholly owned subsidiary. 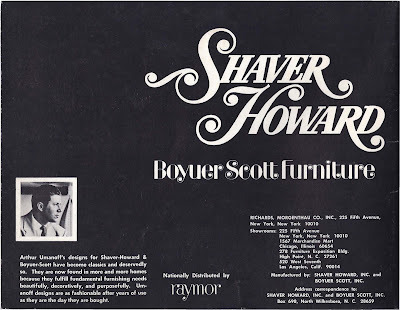 For the short term Boyuer Scott still operates under their own imprint and maintains their own production and manufacturing, gradually over the next two years Boyuer Scott will be subsumed by the parent corporation, Shaver Howard. 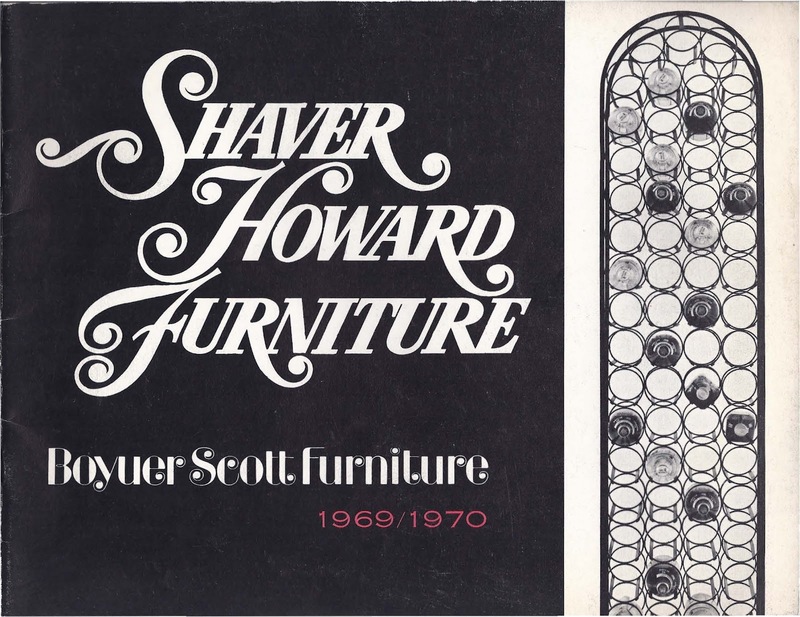 The following page scans are taken from the first Shaver Howard/Boyuer Scott joint catalog for 1969/1970. Elton and Post Modern Ltd. Some very early publicity/ordering materials from the Elton Company recently surfaced and made their way into my hands. 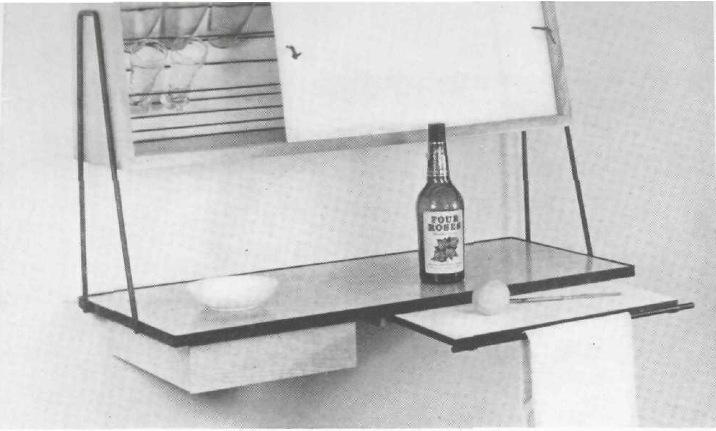 A total of 7 pages which very clearly answer one of my long standing questions about Umanoff's earliest work, the mystery of Post Modern Ltd.
"Arthur H. Umunoff has tried in his work to substantiate the thesis that the fundamentals of pood design are in every way analogous to good homemaking. Accordingly, he works each item of furniture from the drawing board, through his own shop where he handles the raw materials directly, to actual use in his New York home with wife, Charlotte, and two young sons. As a partner in Post Modern, Ltd., which manufactures from his designs. Arthur has a hand in producing, merchandising, and selling, too. 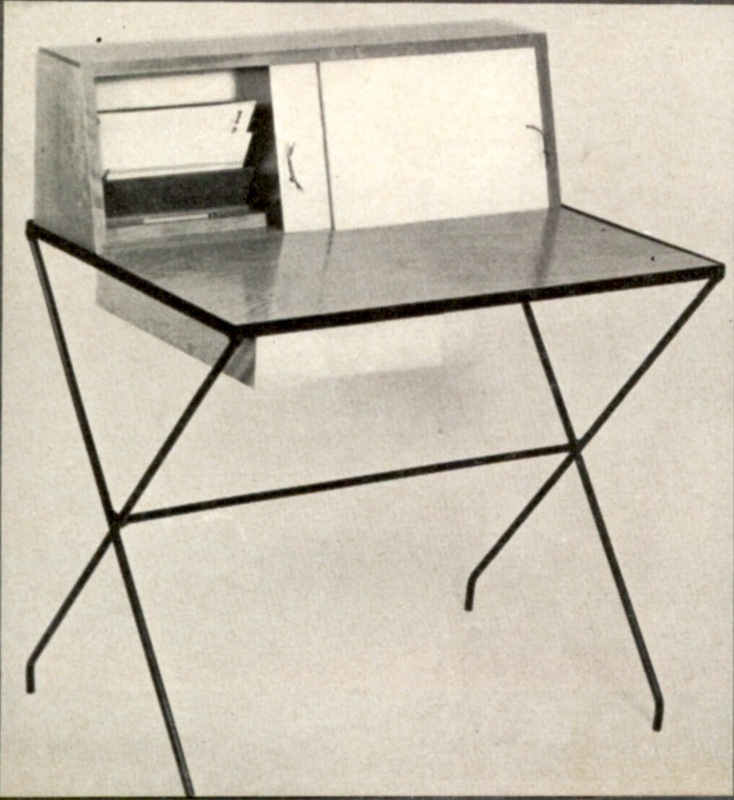 Some of his most interesting pieces are those which combine wrought iron and wood or laminated plastic: well sized desk (36x24x45) retails at $50, in birch, walnut or Formica; combination lamp table and magazine rack at $40 is available in the same materials"
This is the sole mention of this company and for quite some time it was all I had to go on, but now with this new documentation the picture begins to become clear. In the very small print at the bottom left of the page is the following text "Manufactured by Post Modern Ltd., Springfield Gardens, L. I., N. Y.". and to the right the legend proclaiming exclusive distribution by the Elton Co., Inc. which pretty clearly defines the relationship between Umanoff, Post Modern Ltd., and The Elton Co..
Let's start at the beginning. 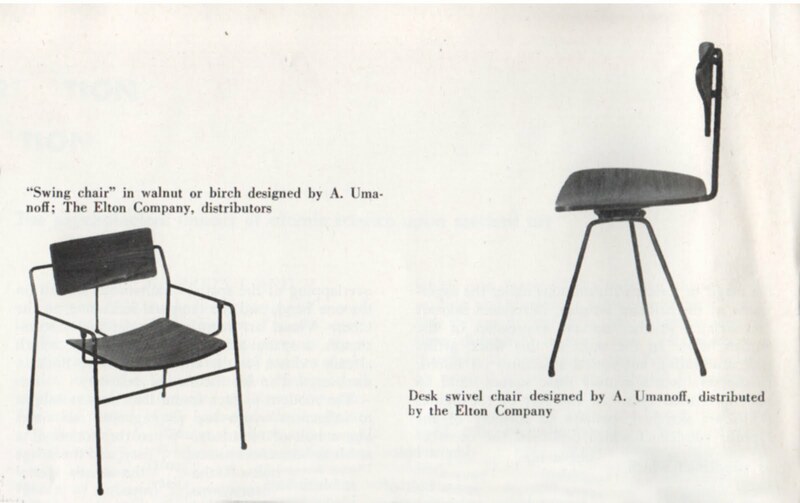 For Arthur Umanoff the beginning is at the Elton Company where in 1952 his designs first began to be sold to the public. 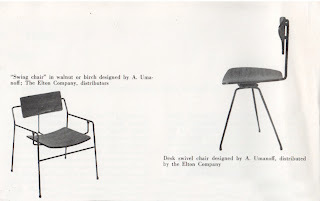 Little is known about this first collection as there seem to be no surviving photos from this time period and the only reference to it at all occurs as one line of text in a early Elton Co. advertisement in Interiors of June 1952. About the Elton Co itself we also know very little. According to www.tonypauldesigns.com "The Elton Company was a collaboration between Elliot and Tony" but when I contacted Lori the author of the site for clarification on this she was able to add very little. All we know is that Elliot was a ceramicist. 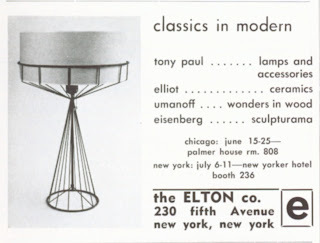 Elliot is never mentioned again in any of the Elton advertising which I have come across. 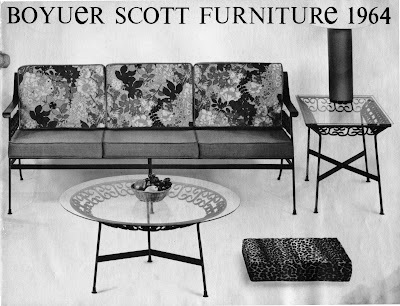 By late 1952 Arthur Umanoff is seemingly no longer making "wonders in wood" and has taken to using a combination of materials in his designs. 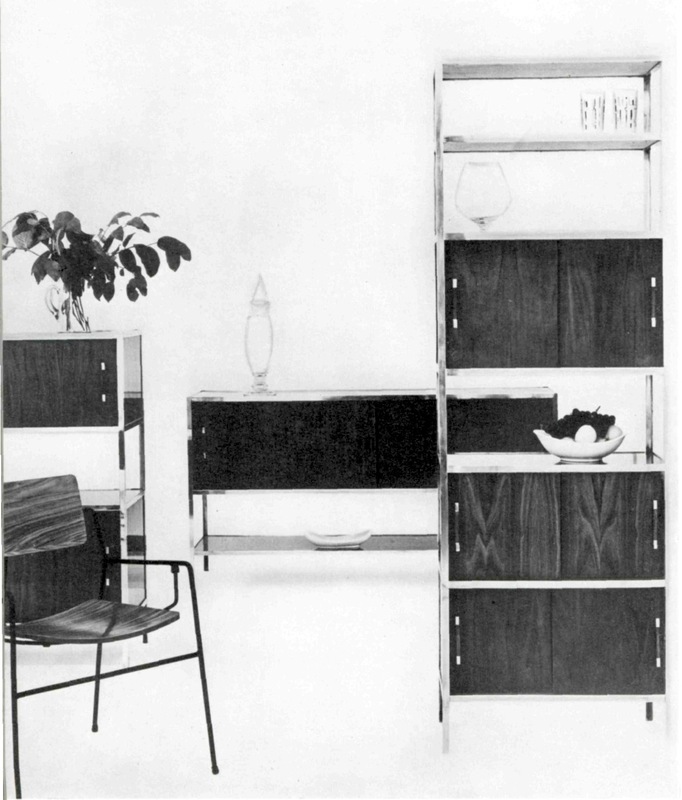 serving carts and a complete line of case pieces which get Elton and Umanoff chosen for the 1953 Good Design Exhibit at the Museum of Modern Art in New York City. The Umanoff designs for Elton were also featured in a two page pictorial in the October 1953 issue of Interiors magazine, images from this article are later re-used for the 1954 Storage: Volume 4 of the Interiors Library series edited by George Nelson. It would seem that things were pretty good for the Elton Company but mysteriously there is no further mention of them after the October 1953 Interiors article, not a stitch. It's as if they have vanished from the face of the earth and this very well might be the case as the trail picks up in July of 1954 in a advertisement for Peter du Jardin's Tropic Shop in New York City. 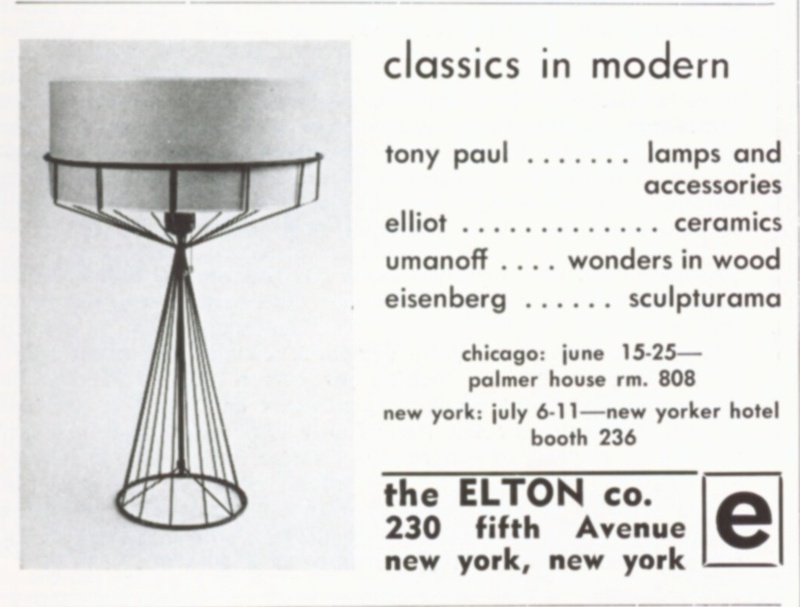 There's no mention of Umanoff or the Elton Company in the ad, none whatsoever, but there's no question that the chairs pictured are the Umanoff designed chairs for the Elton Company and if those are the Elton chairs then the cases must be from Elton too... and designed by Umanoff. The cases are properly credited to Umanoff in later advertisements. My best guess given the available information is that Elton went belly up sometime in 1953/1954 and that the Tropic Shop, with whom they were already doing business, picked up their remaining inventory. Over the coming months I will be working on expanding the available knowledge base on this truly remarkable american designer.